Colonel Blood and the theft of the Crown Jewels. Colonel Thomas Blood (1618 – 1680) was of Anglo-Irish origins, born in County Clare, in what was then the Kingdom of Ireland.Following the Restoration of King Charles II, the 1662 Act of Settlement cancelled a grant of land allocated to Blood by Cromwell, as a reward for his services during the Civil War, and brought Blood to financial ruin. Blood sought to unite the remaining Cromwellians in Ireland with the aim of insurrection. A plot to storm Dublin Castle, overturn the government, and kidnap the Duke of Ormonde (The Lord Lieutenant of Ireland), was foiled and Blood fled to the Netherlands. A few of Blood’s collaborators were captured and subsequently executed. As a result, historians have speculated that Blood swore vengeance. 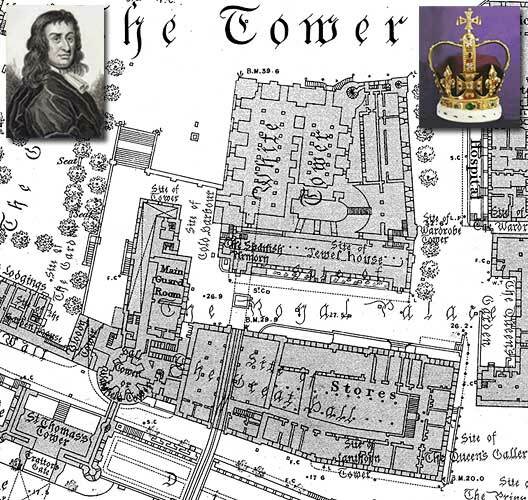 Blood returned to England in 1670 where, six months later he made his notorious attempt to steal the Crown Jewels.In 1671, he visited the Tower of London, dressed as a parson and accompanied by a female companion pretending to be his wife. While viewing the Crown Jewels (made possible by the payment of a fee to the custodian), Blood’s companion feigned stomach pains and begged the Master of the Jewel House, 77-year-old Talbot Edwards, for help. Edwards’ wife invited them upstairs to their living quarters to recover, after which Blood and his ‘wife’ thanked the Edwards and left. Over the following days Blood returned to the Tower to visit the Edwards and presented Mrs. Edwards with a present of white gloves as a gesture of thanks. As Blood became friendly with the family, he proposed that a fictitious nephew of his should marry the Edwards’ daughter, a marriage that he said would make her eligible for an income of several hundred pounds. By the 9th May 1671 Blood, now accepted as a potential moneyed in-law, convinced Edwards to show the jewels to himself, his supposed nephew, and two of his friends. On entering the Jewel House a cloak was thrown over Edwards, who was then struck with a mallet, bound, gagged and stabbed. Blood then used the mallet to flatten the ‘St. Edward’s Crown’ so that he could hide it beneath his clerical coat. Blood’s accomplice, his brother-in-law, used a file to saw the ‘Sceptre with the Cross’ in two to enable it to fit into a bag, while the third man, Parrot, stuffed the ‘Sovereign’s Orb’ down his trousers. Fortuitously Edwards’ son was returning from military service and stumbled upon the scene. At the same time Edwards managed to free the gag and raised the alarm shouting, “Treason! Murder! The crown is stolen!” Blood and his gang fled to their horses. They dropped the crown and the sceptre and fired at the warders who attempted to stop them. They were finally chased down and captured by Captain Beckman, brother-in-law of the younger Edwards. Following his capture Blood refused to answer to anyone but the king and was consequently taken to the palace. To the disgust of Lord Ormonde, Blood was not only pardoned, but also given land in Ireland worth £500 a year. Following his pardon Blood became a familiar figure around London and made frequent appearances at Court, before he died on August 24 1680 at his home in Bowling Alley, Westminster.